Augmented reality ski goggles #WearableWednesday « Adafruit Industries – Makers, hackers, artists, designers and engineers! Cool or scary? Via ChipChick. Looking for something a little more interactive than an action cam when you’re hurtling and/or tumbling down the slopes? 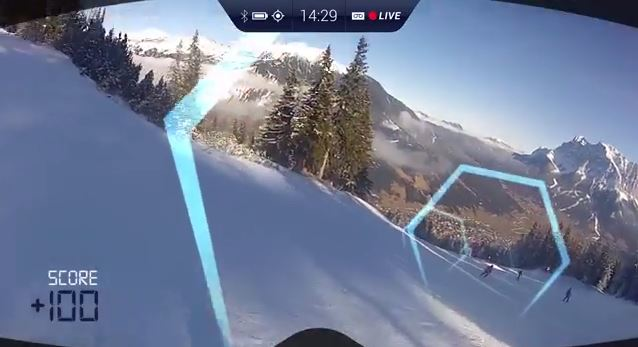 RideOn has created a pair of augmented reality ski goggles so you can see your friends laughing at your misfortune while you’re livestreaming. But first, the augmented reality bit. The ski goggles have a bare-bones heads-up display showing battery life, time, and streaming status. You’ll also see blue rings that you can interact with just by looking at them—focusing your eyes on the ring makes a menu pop up, which you also control with your eyes. Those rings can represent lodges or restaurants on the mountain or fellow skiers wearing these ski goggles. You’ll be able to send those other skiers simple messages or hit them with a virtual snowball, which I’m guessing won’t be as satisfying as hitting them with a real one. They have a little bit of practicality to them, too. Should you get lost on the mountain, you’ll be able to see your location on a map, so you can get your bearings and make it back to the lodge. Admittedly, the ski goggles sound like they could pose a pretty significant distraction while you’re trying to ski or snowboard—it probably goes without saying that only the most experienced among us should be trying these out on the actual slopes. In the meantime, we’ll check them out from the (relative) safety of CES, where RideOn will be showing off what they’ve got.